For those of you who do not eat eggs and are vegan, ever imagine what Creme Brulee tastes like? Well I’m not sure how close the taste of this recipe is to traditional creme brulee, but if it’s anything similar, it’s no wonder people love it! Recently I’ve been hearing a lot about Chef Chloe from Cupcake Wars and had already tried her avocado pesto recipe from her website. So when I came across this vegan Creme Brulee recipe, I knew I had to give it a try. Traditional Creme Brulee consists of a rich custard base with a hard caramel top. This recipe creates the rich smooth custard texture with the use of cornstarch. The result was very yummy and full of flavor. This recipe is also extremely simple to make, and I already had all the ingredients in my pantry. Unfortunately, I had to make it 3 times before I got it right…that night I forgot sugar the first time, and vanilla extract the second time. So you can believe me when I say the recipe is quite simple to make! I felt like this dessert needed some creamy topping, so I topped it off with some coconut whipped cream! Enjoy, and thanks to Chef Chloe for this delicious recipe! 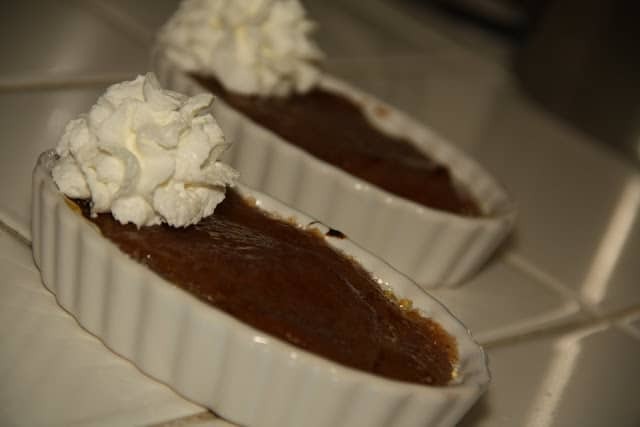 For the recipe, head on over to Chef Chloe’s website – Holiday Spiced Creme Brulee (vegan, gluten-free), and top it off with some fresh coconut whipped cream.